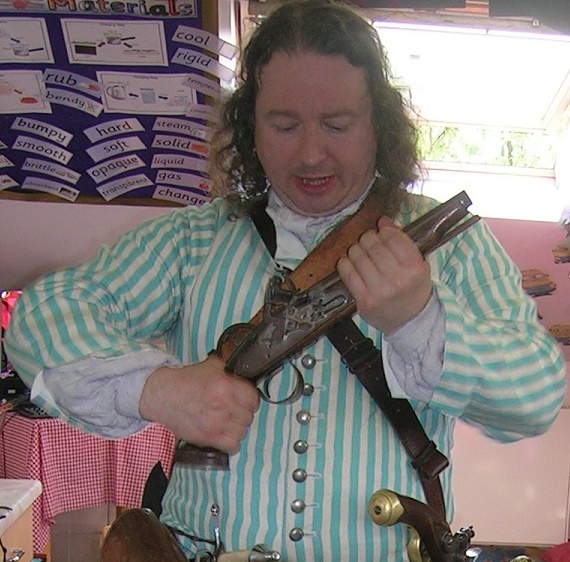 Armed with my new waistcoat (‘clothes maketh the man’) I recently visited Highfield Prep school where I met with a crew of sea rovers and scurvy scallywags, seasoned with a smattering of privateers and buccaneers. 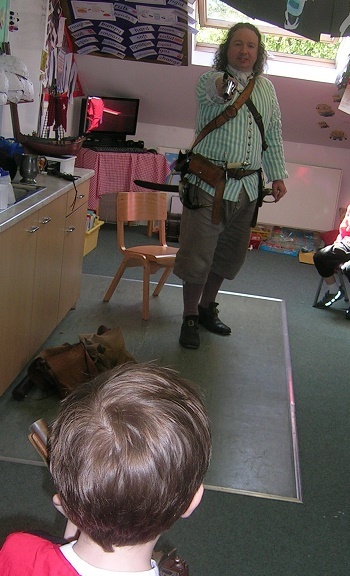 I spent the day telling them all about my adventures at sea, and showing them all sorts of artifacts that pirates like to use. I told them some scary stories about Blackbeard, let them all study a pile of pieces of eight, and demonstrated more weapons than, frankly, a man should really attempt to carry – a grenado, musket, pistols, cutlass, boarding axe, roundshot, chainshot, etc. And then the duel commenced! Luckily the two of us proved to be appalling shots and we both missed. Glad to be alive we decided to be friends again and put our differences behind us. All in all we had a lovely day, and only the other day I received a bundle of letters thanking me for visiting and telling me what their favourite parts of the day were. Since then I have managed to get even more things for my pirate character, including black leather belt and baldrick (it’s the details that count), and I have even sewed up a brand new shirt too. I reckon soon I’ll be the fanciest pirate this side of New Providence. I have just completed another sewing project for my characters – this time a sleeved waistcoat for my pirate Captain Burwash. As always I ensured it got done by setting a deadline – before my school visit tomorrow. Thus the task involved several 2 am bedtimes! I am happy with how it turned out. 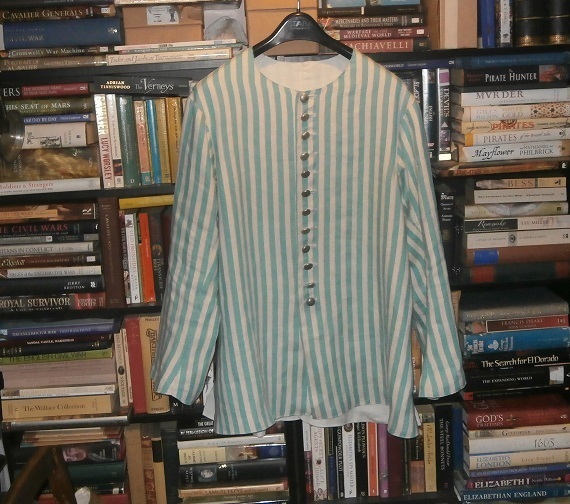 I wanted a waistcoat just like that of an early 18th century sailor. I did some research and these were the sort of images I found. It does have the shape of the first picture, but it doesn’t really hang on a hanger in such a way as to show it. I am very happy with it, and admit I will be a little bit excited to wear it tomorrow (as I usually am when I make something new). I had fun converting my only ‘pattern’ for a coat – four constituent shapes taken from a late 17th century coat and from which I have converted every coat and waistcoat since. Cutting a pattern from striped fabric was new to me. It was easier in some ways, more difficult in others. I made it in one of the ways clothes were made back then: each piece was made separate (front and lining sewn together as one). 8 pieces in all, sewed inside out then turned right way out. Then I joined it all up by sewing the inside seams (the lining), then sewed the outside seams, then sewed the edges all around. All by hand, and all with real linen thread. If you’re going to go to all this effort, might as well use all the right materials. I am now itching to do some more sewing. Maybe some new shirts are in order? Preparing for the Future – the Distant Future! 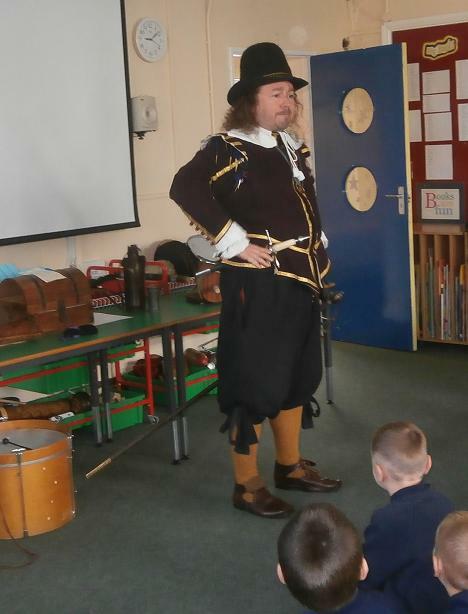 Sir William Petty has been very busy of late gathering all he might need for his audacious journey through time. He wants to ensure he has everything required to measure and record what he finds, as well as take samples; to scrutinise and inspect both the larger world as well as all contained within it. He hopes to encounter the denizens of the future, and thus be able to question them concerning all manner of things. Suspecting, however, that the future may well contain myriad dangers, he plans to take all he might need to protect himself too. Here you can see not only his trays of specimen bottles, as well as some of his weighing and measuring instruments, but also the plague doctor’s mask his assistant has fashioned just in case the air of the future is replete with foul miasmas and poisonous vapours. I suppose you could call me Sir William’s assistant. Currently, every spare moment I get (between school visits and the boys) is spent on reading, research and readying the artefacts and materials needed for his trip. Let’s just hope that when he is transported through time all this stuff travels with him! Now, I must get back to work. Sir William is a hard task master. My First Trip Around the World! 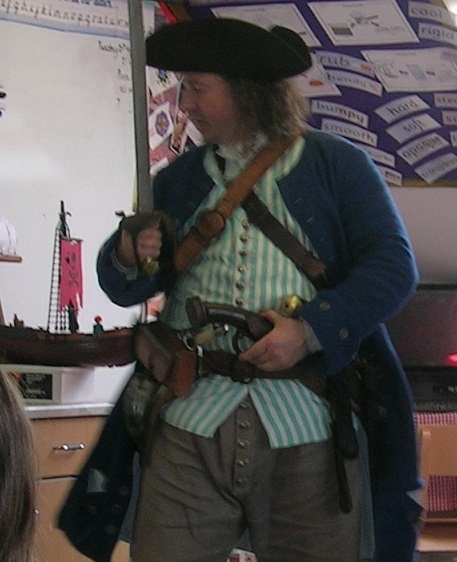 I have been three different kinds of pirates this week: a highwayman on Monday (a land pirate), an Elizabethan Sea Rover on Wednesday (a patriotic pirate) and a plain old scurvy scallywag yesterday (from the ‘Golden Age’ of piracy). All great fun. One of these visits was my very first as a new character. 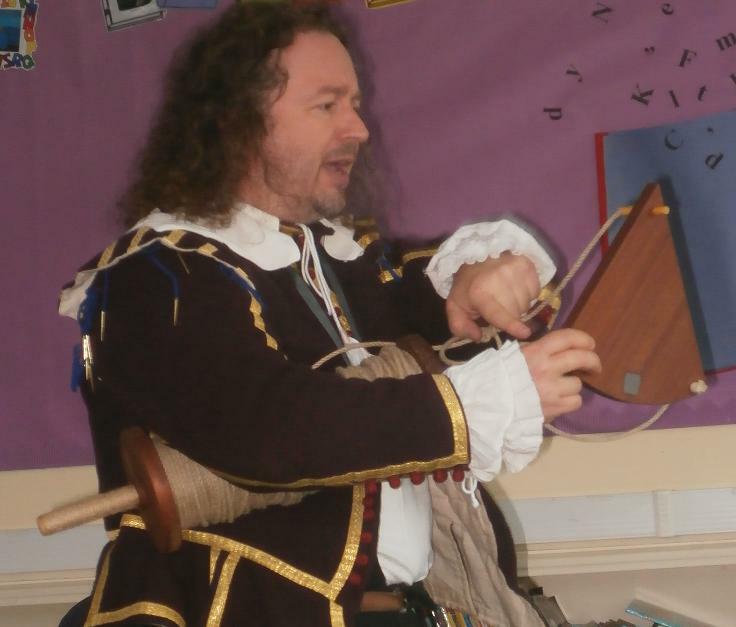 On Wednesday at Bottesford Infants I became Laurence Eliot, one of Sir Francis Drake’s sailors who went all around the world with him in 1577-80. 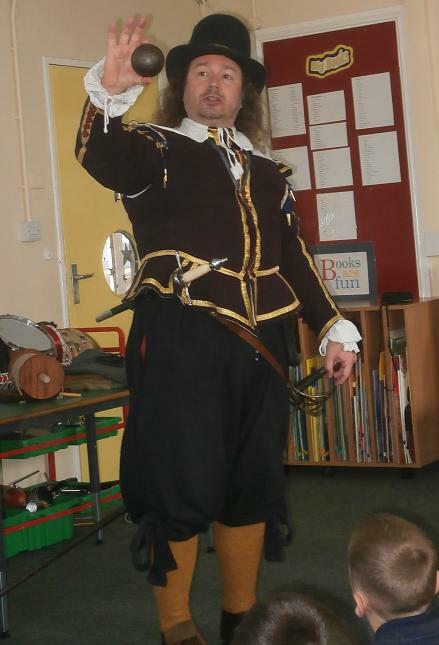 The teachers at Bottesford wanted their children to study a historical traveler to compare and contrast with Neil Armstrong, so I suggested Sir Francis Drake and his incredible journey – and thus talked myself into a summer of reading and learning for the new character. Of course, I loved it as reading history books is my favourite thing! The day went very well, as I suspected it would. The story of the circumnavigation is a great adventure, full of strange events, curiosities and terrifying dangers – Patagonian giants and magical cannibals, mountains made of silver and flying fish, giant crabs and storms that lasting for weeks and weeks. The children listened wonderfully well (and all 90 had only just started Year 2). 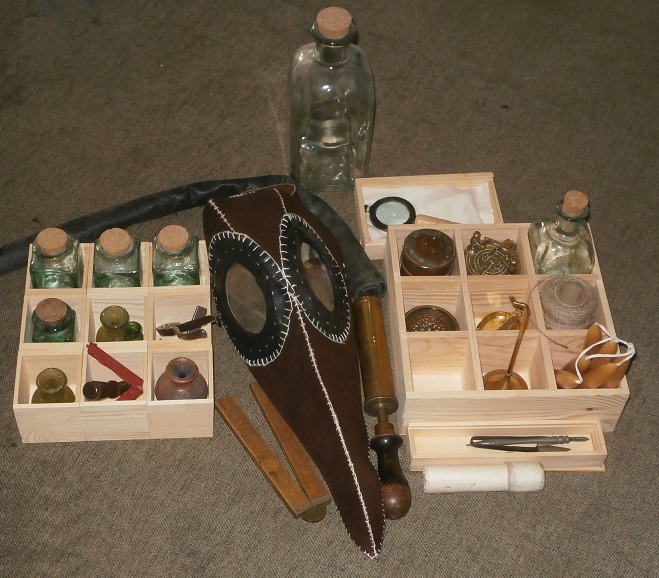 Of course I had all sorts of artifacts and things to show them as well, from mysterious navigational instruments to rapiers and muskets, from bags of spices we brought back from the Moluccas to a bar of silver taken from the back of a Llama on the coast of Peru. 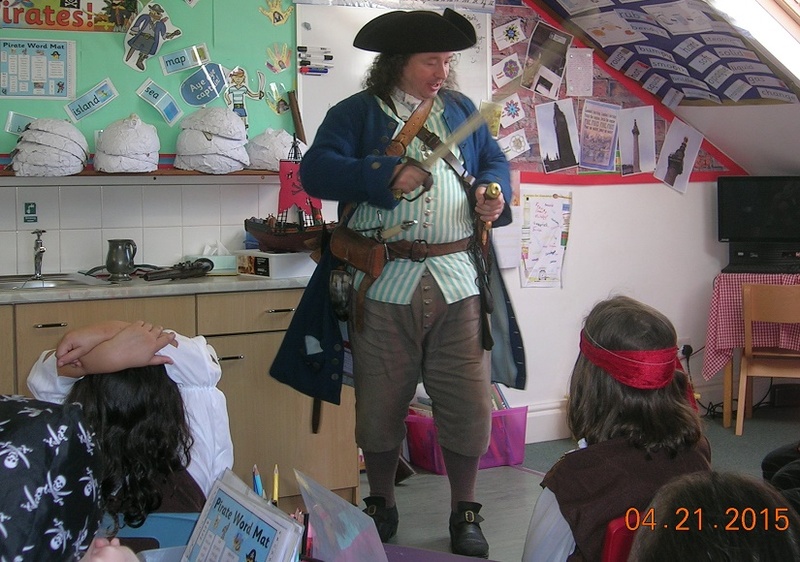 We even had a knot tying competition to see if the children could have helped us repair our ships, and other children carried various things to get a feel for what we took with us. It was a lovely day. I hope soon to create a new web page for this new character. 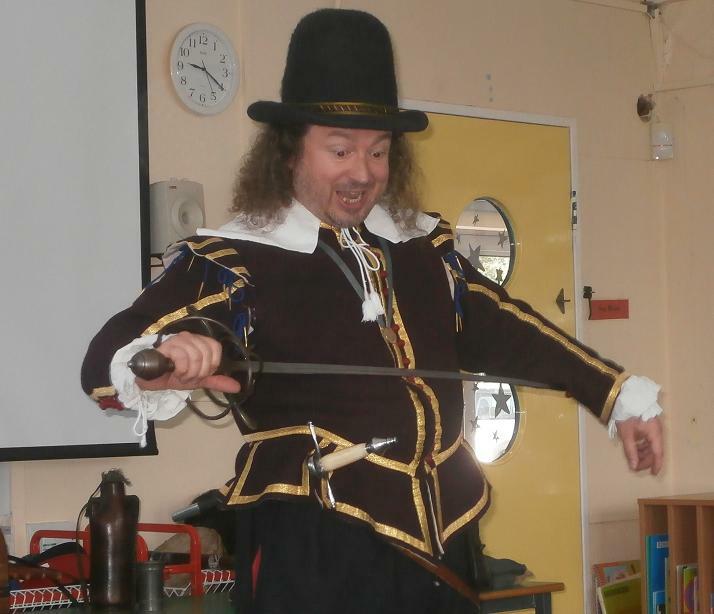 But in the meantime, if any of you teachers are interested in such a well traveled character from the past, who can tell all about the very famous Sir Francis Drake’s most marvelous exploit, then please get in touch and we’ll arrange a date. I can’t wait to go around the world again! Last weekend Skipton Castle was once again defended by Colonel Sir John Mallory, as well as many well affected gentlemen, officers, soldiers and much of the populace of Skipton, as Commissary General Sydenham Poyntz’s besieging force set about surrounding the castle and building batteries for the artillery pieces expected to arrive any day. Well, I say all those people were there … But the funny thing was Sir John could find none of them, not one soldier nor even his own manservant William Layton. 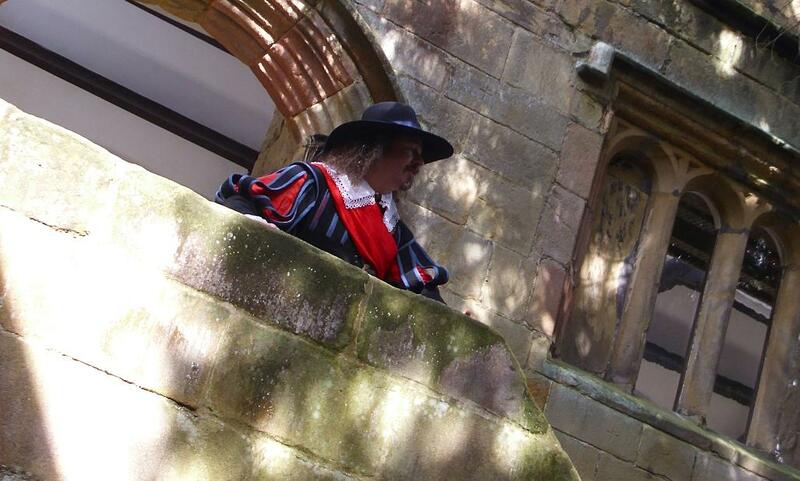 It seemed to him, as he stood looking out over the little courtyard in the midst of the tower, that he may as well be on his own! Whilst on the topic of being very little, Sir John failed to notice two things – one not so surprising, the other extraordinary. 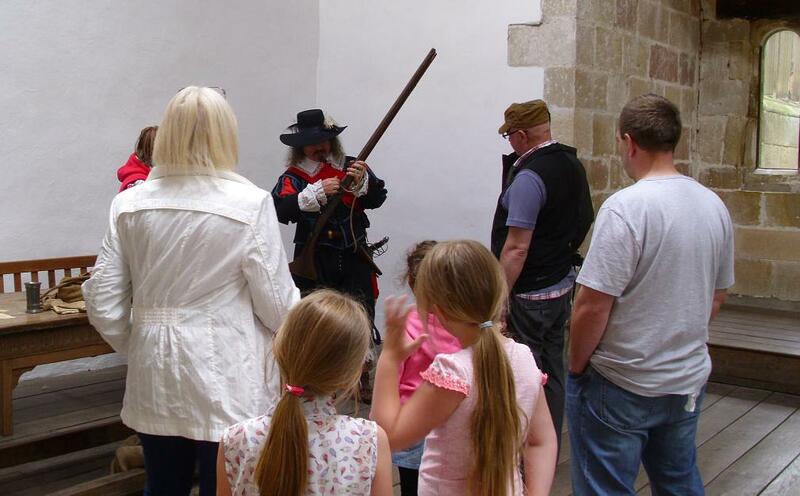 The first was that his little daughter Elizabeth, a girl of 3 years old, had sneaked in to listen to him wax lyrical about why he served the king so loyally. The second was the strange fact that his daughter looked just like a little boy! 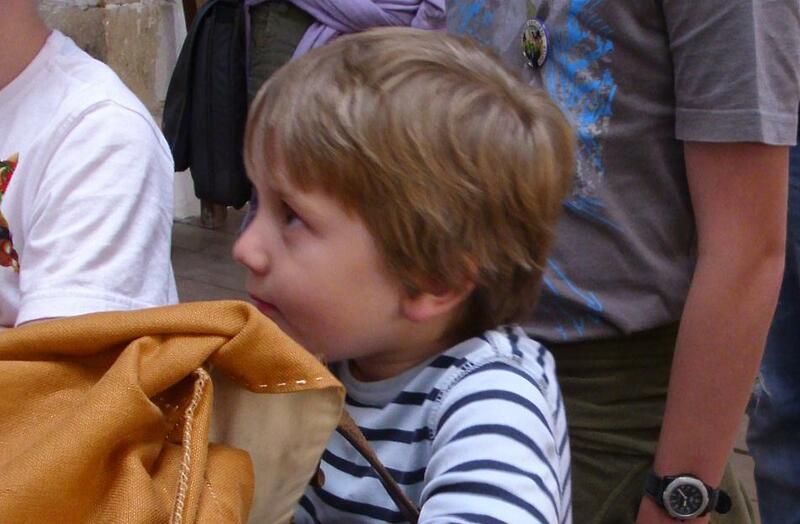 Admittedly a very handsome one, but a boy nevertheless. 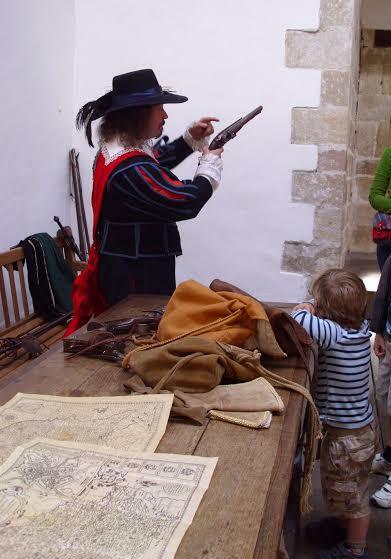 I am now preparing for the Autumn school term – from reading to sewing, from fashioning maps to buying spices. 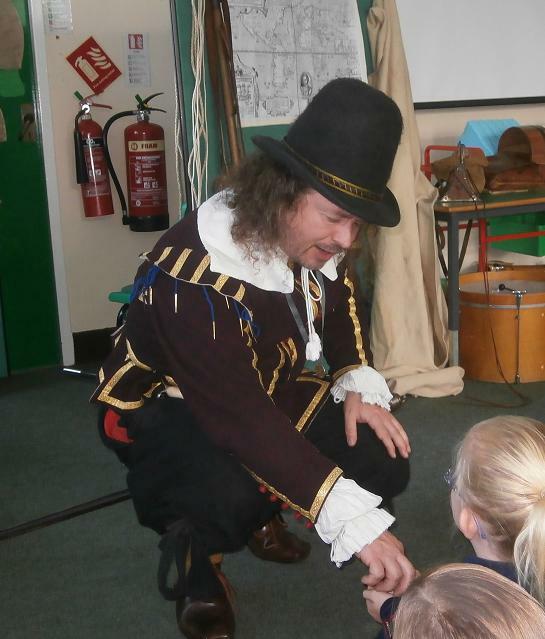 To see which of my characters you might like to visit your school, please take a look at my page of Characters. I hope to hear from you.